Common Law Admission Test (CLAT) is entrance exam test for the candidate to get admission in law courses which is conducted by 18 National Law Universities (NLUs) rotationally every year. This exam is an aptitude test designed to check mental and aptitude abilities in relation to time management. The CLAT Exam 2018 will be organized by the National University of Advanced Legal Studies. Those who are interested in the CLAT exam 2018 can go through this entire article. Now you guys must be thinking that how you can fill CLAT 2018 Application Form? Here is the answer, before you are going to apply for the CLAT Exam 2018; a candidate has to register themselves on the actual AILET website to fill the CLAT exam 2018 Application Form. For filling CLAT 2018 Application Form registration has been started from 1st week of the January 2018. A candidate has to feed all the valid personal details asked in CLAT 2018 Application Form. 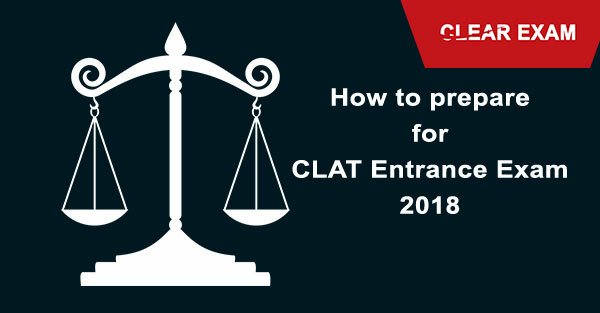 Last but not least a candidate who is going to fill the CLAT 2018 Application Form should know the eligibility criteria before filling the form so that at the time of admission there is no problem. The CLAT 2018 Date to fill the online form is March 2018. Every year the eligibility criteria are announced by the NLUs and this year CLAT exam pattern was announced by NUALS Kochi (National University of Advanced Legal Studies) in December. Those candidates who are going to apply for the national level law entrance exam need to know and read the CLAT Exam Eligibility Criteria. CLAT Exam Eligibility criteria have some conditions which have to be filled by each and every candidate. As per the CLAT exam committee, CLAT Exam Eligibility criteria consist of academic qualifications, minimum marks, and CLAT 2018 Age Limit required for applying for CLAT exam. NRI / Unreserved category applicants below 20 years of age as on July 01, 2018 can apply for CLAT. As per CLAT 2018 Age Limit criteria for LLM course. SC/ ST/ SAP category applicants below 22 years of age as on July 01, 2018 can apply according to CLAT 2018 Age Limit Eligibility. In General, Specially Able Persons (SAP) and other categories, a candidate have to score minimum 45% marks. For SC/ST Category one has to score the minimum of 40% marks. There are no upper age limit criteria as per the CLAT 2018 Age Limit. For General /Specially Able Persons (SAP) and other categories, an aspirant has to score the minimum of 55% marks for the Eligibility of CLAT Exam. A one should know each and every clause of CLAT Exam criteria because if a one has filled the application form without verifying CLAT eligibility and at the time of admission it is found that the candidate does not fill the eligibility criteria. In this case, the candidature of the candidate deemed to suspend/ cancelled at any point in time as fulfilling of CLAT eligibility is mandatory. And also, the application fees submitted by the candidate will not be refunded if candidature of the candidate is cancelled due to nonfulfillment of eligibility criteria. Here are all the important CLAT 2018 Dates which you should know so you will not forget any step of CLAT 2018 exam. So these are the topics you have to prepare for the test according to CLAT Exam Pattern. But each and every topic is very important to be prepared efficiently. In this section, the proficiency in English will be analyzed on the basis of those multiple choice questions related to comprehension passages and grammar. On the basis of this comprehension passage candidate’s knowledge will be evaluated on the basis of their understanding of the passage content, meaning of words etc. and in grammar section the knowledge will be tested by selecting correct and incorrect grammar in the given sentence and options also there will be filled in the blanks with the correct options. How to prepare for CLAT GK? According to CLAT Exam Syllabus For this candidates need to be up to date with news and other topics discussed in news from March 2016 to April 2018. This section of CLAT exam is much easy and scoring from others. If you will take last year papers, you will get to know that 30-40 questions will come from current affairs and others from static G.K. So you need to focus on current affairs for this read the newspaper most or read the book we referred you. How to prepare for CLAT Maths? This section consists of 20 questions and will test candidate’s elementary mathematics knowledge viz. Math up to 10th. So, Candidates must devote their preparation to this section as well. As in CLAT exam, all the topics are equal to prepare and in this section, questions are generally elementary in nature and with little preparation you can easily able to solve 15-18 questions and with accuracy. So prepare for it and take the mock test which will help you more. How to prepare for CLAT Legal Aptitude? According to CLAT Exam analyze Syllabus in this section, candidate’s aptitude and interest towards law will be checked. Also, they will analyze candidate’s research aptitude and problem-solving abilities. The question of this section will be framed with the help of legal prepositions and on the fact which said proposition has to be applied in the questions some of the prepositions are not correct in which candidates have to analyze the truth and answer them. How to prepare for CLAT Reasoning? In all the five section this section is considered as the most difficult. But it only needs full concentration and dedication. Also, the number of question in this section is high so you cannot afford this section at all. If you practice it and make your concept clear then this section will help you to boost in the CLAT exam. To prepare this section, first of all, clear your basic concepts than do sufficient practice of the rest. Make strategy take mock test and there you go. This is the CLAT Exam Syllabus which candidate has to prepare properly, each and every topic is necessary to prepare because in the exam negative marking is there. With the help of the exam, pattern and syllabus candidate can make CLAT toppers study plan. If a candidate needs personal syllabus data can also go for the option CLAT Syllabus PDF Download available on our portal. CLAT exam syllabus 2018 is announced by NUALS Kochi and there are no changes in the curriculum. So the exact CLAT Syllabus PDF Download option is also available on the actual CLAT 2018 site. The CLAT syllabus is a guide to the candidates who give them away how to prepare CLAT toppers study plan for the exam so, candidates need the syllabus every time when on the desk to prepare for the CLAT 2018 for this a very easy option for the candidates is CLAT Syllabus PDF Download. With the help of the option CLAT Syllabus PDF Download, the syllabus software copy can be saved for the further preparation for CLAT exam. The Detailed CLAT Syllabus PDF Download consisting of CLAT Syllabus will appear on your screen on our portal. Now, Question will arise How to prepare CLAT? CLAT will test your aptitude for law through 5 topics which are mentioned above. At the time when you are thinking how to prepare CLAT, you should know your weak and strong subjects, in the very beginning. You have to build up the weak subjects and polishing the weak ones and you have to make a proper strategy for you like what CLAT preparation books you are going to select for you because there are so many CLAT 2018 books for preparation. This question How to prepare CLAT makes candidates exhausted at the time of preparation. As the number of aspirants for law studies is increasing every year and it is making the competition very tough also candidates got confused at the time of making strategy for the CLAT preparation because there are so many ways to prepare so question arises in the mind like, what CLAT preparation books should consider as there are so many CLAT 2018 books or how to prepare for CLAT without coaching, how to crack CLAT in 1 month, how to crack CLAT in 10 days, what should be the CLAT toppers study plan and so on. Now here we will discuss each and every clause or query one by one. How to prepare for CLAT exam at home? CLAT preparation at home is the best option to prepare for the CLAT exam because you need to prepare all the topics efficiently in a very less time which plays a vital role, but now the question arises How to prepare for CLAT exam at home and make a CLAT toppers study plan for the exam? So for preparing CLAT at home, you should have proper study material such as best books for CLAT preparation 2018 and other study material which contains all law examination questions related topics in detail. You can also take the online free mock test which is available on our website. It will enhance your skills and knowledge and help you to know the strong and weak points of yours. Also, you can practice that per topics also, so you can prepare those topics more in which you are weak. Mock test will also help you to enhance your time management as well. So this is the answer to the question “How to prepare for CLAT Entrance Exam 2018 at home” by this method you can easily prepare for the CLAT 2018 and can able to maintain time management. Last thing for how to prepare for CLAT exam at home you just need to be fresh so sleep well, Practice mock test, make use of online resources and be prepared and organized. Also, a candidate can take this point as the answer for How to prepare CLAT by self-study or how to prepare for CLAT without coaching. Now you guys must be thinking about a proper exam preparation study material such as CLAT preparation books, CLAT 2018 books, books to crack CLAT, best books for CLAT preparation 2018 and so on. First of all neither a book is worst nor is a book best for study it totally depends on the candidates some candidates like some and some of the others. To study English section these books will cover the topics and are the best books to crack CLAT. To study this section this book will cover all the section of general awareness and current affairs as well. To prepare this section, this book will have to prepare all the topics of CLAss 10 the standard and also give you the shortcuts to solve the easily in time. This book will help you to prepare the reasoning part. So these are the books you can take as an answer to your question which is CLAT preparation books or CLAT 2018 books or books to crack CLAT or best books for CLAT preparation 2018 and so on. If you will go through these books you will find these books more helpful to prepare these are considered as the best books for CLAT preparation 2018 or best books to crack CLAT. Some candidates want to know how to prepare for CLAT without coaching? Then you have to practice as much as you can by using model test papers, sample papers, mock test and others. You should not take tension, enjoy your preparation. Understand the exam pattern and make a strategy. By going through these points you will get know how to prepare for CLAT without coaching also? You don’t need to fill exhausted by thinking again & again how to prepare for CLAT without coaching it is all depends on your own capability. Now some candidates need to know how to crack CLAT in 1 month or how to prepare for CLAT in 6 months? Collect all the information about CLAT and analyze the past year papers. It will hardly take much time to analyze the last year papers you can take first two days for analyzing the papers. Realize the time you have now and move forward, remember the question how to crack CLAT in 1 month/how to prepare for CLAT in 6 months? Make the strategy to subject wise according to the time you have. And now like this, you can prepare for CLAT in the time period and also if anyone else will ask you how to crack CLAT in 1 month or how to prepare for CLAT in 6 months you can reply them as well. But, what will you say if anyone else asks you how to crack CLAT in 10 days? It will become very difficult. Here is the answer to your question how to crack CLAT in 10 days? I think now you guys have the answer of how to crack CLAT in 10 days. These all are the CLAT toppers study plan. So, all the best and if you have any other query please contact us anytime. how to prepare for Clat Entrance Exam 2018? Get important tips and step by step direction like Eligibility Criteria ,Age Limit,Academic, Pattern and choose good books.